At Doty & Sons Concrete Products, Inc. we manufacture both standard and custom products. Recently we were awarded a contract from W.E. O’Neil Construction to manufacture custom bench/seating for a project in Chicago, IL. The design called for concrete seats with custom steel support frames. The project design consisted of 20 feet of straight seating in one section. Another section was 12 feet of seating, transitioning into 23 feet of curved seating. The curved seat matched the arc of the existing wall. 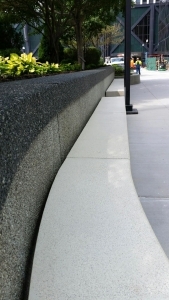 The concrete seats were cast using a custom concrete mix. The seats were polished and than sealed for a semi-gloss concrete sealer. The steel brackets were custom fit so that the seat would be level in relation to the changing grade below. On site field measuring was required to assure a proper fit. The steel brackets were hot dipped galvanized for long term corrosion resistance. Call or email if you bidding a custom project. We can manufacture products based on drawings provided or on conceptual plans. Products can be made using standard and custom concrete mixes. We also offer a complete line of products on our web site. 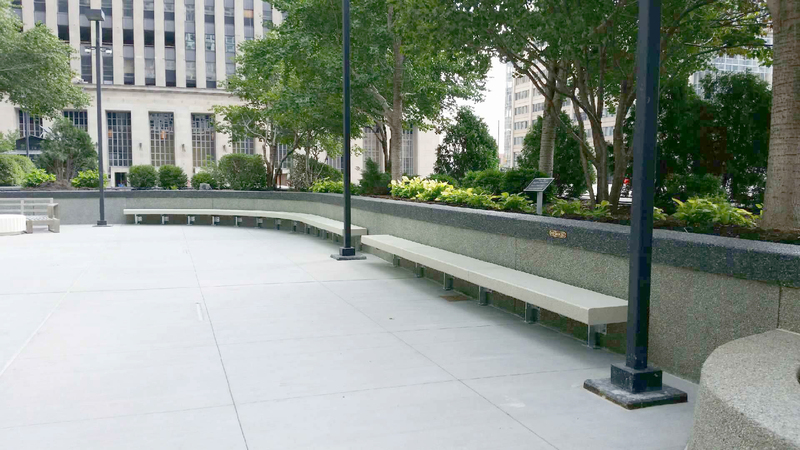 Custom concrete bench with steel support brackets.